Well I don't know about you guys, but I'm beat from yesterday's festivities... My family knows how to get down, so we didn't get to bed until 2 am last night — Can you say party animal wannabes? I think I'll be paying the price in the under eye region today as I travel to Vancouver to see Mr. AiF's fam-jam... What can I say, it was worth it. 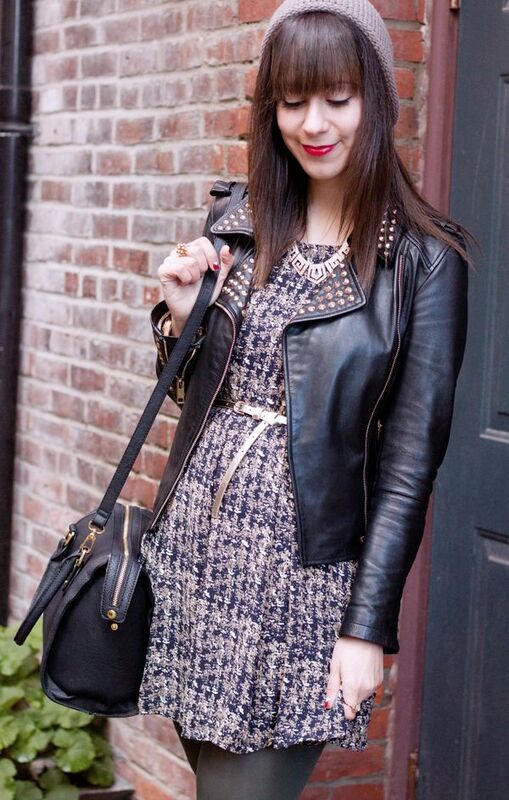 I looove this dress, such a pretty pattern and so lovely with the leather jacket. Sounds like a really fun christmas!! THat dress looks amazing the way you styled it, I love it so much! Sounds like a fun Christmas... Mine was tame by comparison! Love this outfit Vick! I would so wear this out shopping or out with friends. I love layering leather over everything especially dresses. Cute dress! Jealous of the pictures that aren't in snow!!! Enjoy your time in Van! And I love that dress. I'm headed to WEM today to finally see the new store and I can't wait!